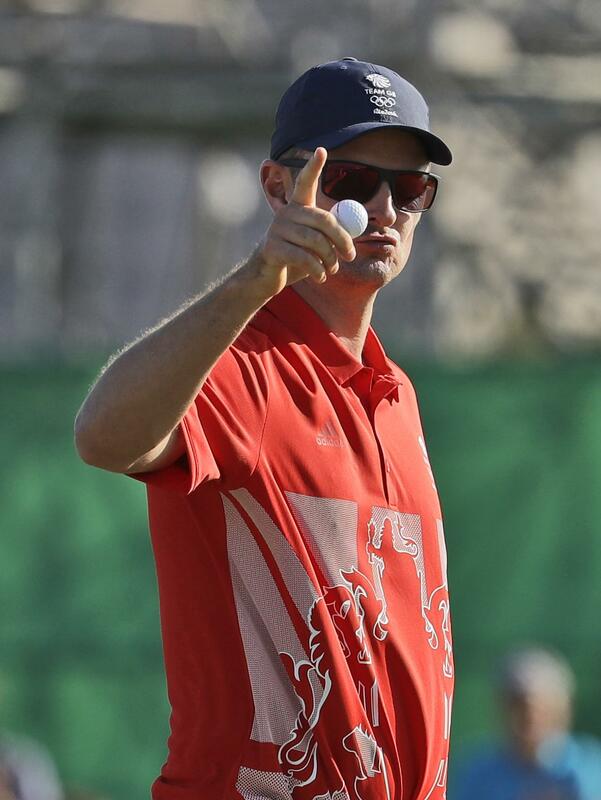 RIO DE JANEIRO – Justin Rose and Henrik Stenson know what it’s like to play next to each other on a big stage when it’s all about the flag and the gold prize. That was two years ago at the Ryder Cup, and they were undefeated as partners. They will be rivals Sunday, playing under their own flag, each pursuing golf’s first Olympic gold medal since 1904. Rose made two eagles in the opening five holes Saturday and did a little shimmy after making a 10-foot par putt at the end for a 6-under 65, giving him a one-shot lead over Stenson going into the final round – the medal round – at Olympic Golf Course. After 112 years away, and three days of what amounted to preliminary heats, golf finally gets the feel of being in the Olympics when medals are awarded. Rose was at 12-under 201, a slim margin over Stenson in any circumstances, even more considering the Swede is a month away from his some of the best golf ever played when he won the British Open at Royal Troon with the lowest 72-hole score in major championship history. Stenson had another 68, his best moment with a wedge in his hand – but not for a shot he hit. Walking along the edge of the water on the par-5 10th hole, Stenson spotted a caiman – a small crocodile in these parts – and reached over to poke it with the end of his golf club. He wound up making birdie on that hole, and two birdies later on the back nine kept him within range of Rose. It’s not a two-man race, even if it felt like one. Marcus Fraser, the leader after the first two rounds, hit into a bunker on four straight holes early on and wound up with only one birdie in his round of 72. He was still alone in third place, though he was four shots behind and his lack of length could be factor in trying to keep pace with Rose and Stenson. Fraser was never expecting to be in the Rio Games until four other Australians withdrew. “Not in my wildest dreams did I ever think I would come to the Olympics and compete, and now all of a sudden I have a chance of winning a medal,” Fraser said. “It feels like I’m going to wake up from this dream at some point. Hopefully, tomorrow I can go out there and play a bit better than I did today. Bubba Watson kept American hopes alive with a 5-under 67 that featured his own surreal moment. Watson had a 30-foot birdie putt on the 14th hole, but when he took his putter back, a clump of mud dropped to the ground. Watson tried to stop his stroke and failed, so the ball traveled only about 6 feet. It would help to make up six shots on Rose, or even two shots on Fraser, to go home with something. Watson shot 67 and was at 6-under 207 with Emiliano Grillo of Argentina and David Lingmerth of Sweden, both shooting 68. Another shot behind were Matt Kuchar and Padraig Harrington, the Irishman who was part of the panel that presented golf’s case when it was voted back into the Olympics. Rickie Fowler had the low round of the blustery day with a 64, though he remained nine shots behind. Rose was four shots off the lead to start the second round, but not for long. He holed a 75-foot pitch for eagle from just short of the third green, where the tees were moved up to make it a 285-yard hole into the wind. Then, he hit 7-iron to 15 feet on the downwind, par-5 fifth hole and made that for another eagle. He took the lead for the first time with a 35-foot putt from off the 12th green. For all the talk about the stars who stayed home, this is just what golf needed in its return to the Olympics. Stenson is highest-ranked player in the field at No. 5, while Rose is at No. 12 and another player hopeful of adding an Olympic gold medal to the U.S. Open trophy he won in 2013. Published: Aug. 13, 2016, 7:15 p.m.